More than a year after the Central Japan Railway Company (JR Tokai) received construction approval to get going on its maglev railways, it has finally unveiled a Series L0 prototype that would put its current bullet train system to shame. Designed to travel at 311 mph, a single one of these high-speed marvels is designed to carry about 16 carriages, which translates to about 1,000 commuters. While Japanese travelers already enjoy a speedy 90-minute trip from Tokyo to Nagoya, this new maglev system promises to cut that journey to just 40 minutes. Announced nearly five years ago, the project has since been extended to include an Osaka-Tokyo leg and will cost around nine trillion yen (approximately $112 billion) when all is said and done. 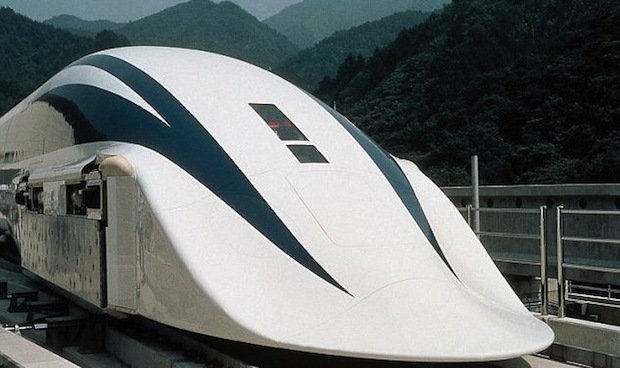 Don't pack your bags just yet though; the maglev's Nagoya rail isn't scheduled to go live until 2027, and the boarding call for Osaka isn't until 2045. Of course, if you need to ride electromagnetic rails now, there's always China's Shanghai Transrapid, which has been ferrying passengers at around 501km/h (311mph) since 2004 -- it's even planning a whopping 1,000 km/h vacuum-tube maglev train in just a year or so. Of course, those of us on the other end of the Pacific are still waiting for that long-delayed California-Nevada maglev project to work out. Sigh.